You can filter multiple inspections created for a particular customer, and then send approval link to a responsible person by email. For example, if you need to get approval for all vehicles estimated at customer’s site during the initial walk, you can set the appropriate named filter, and then send approval link to the customer or manager by email. Important! Lot walk inspections must be created for a wholesale customer, must have the New status, and no work order must be created from such inspections. Tip Learn how to turn on group approval for inspection types. On the Team Inspections screen, tap Search, and then tap Named Filters. Tap the Lot Walk named filter, and then tap the appropriate customer on the Customer screen. 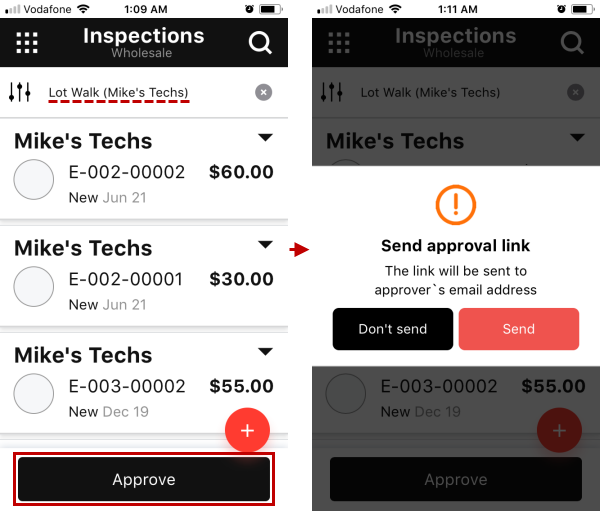 On the Inspections screen, tap Approve, and then tap Send in the Send approval link message. Customer or manager can click the link and then approve, decline, or skip the inspections.